Ah, the humble cockroach. 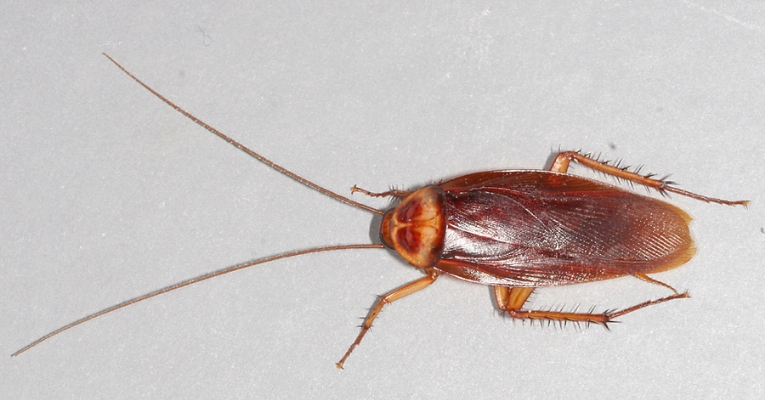 While most of us look on the insect as a disgusting pest, the cockroach is nothing to scoff at. Indeed, while many insects are facing the danger of extinction, many believe that the resilient roach–whose history stretches back to 300 million B.C.–could actually outlast the human race. A 50-year-old Detroit man seemed dead-set on proving that humans rank lower than cockroaches on the evolutionary scale when, according to a WDIV report, the wheelchair-bound man accidentally shot himself when attempting to kill a pesky roach that was creeping around his home. The self-inflicted gunshot wound took place after the man removed his shoe and threw it at the cockroach. There was, however, a problem: the man’s revolver was hidden inside his shoe. As the sneaker flew toward the cockroach, the gun fell out and fired at the man–striking him in the foot. Police officers speaking to the Detroit Free Press were unwilling to confirm whether the liability for the non-fatal shooting rested with the cockroach, but they did note that the man was in stable condition after being taken to the hospital. Social media users reacted to the story with an outpouring of mockery aimed at the man, with some arguing that his license to own a firearm should be removed. “He has no business owning a gun if he’s that careless,” one Twitter user commented. He has no business owning a gun if he's that careless. “Can’t fix stupid,” another user responded. “UNITED STATES OF AMERICA Where instead of stomping on a damn roach, they shoot it 😂😂😂” another twitizen noted in an emoji-laden tweet. According to the Freep, this was definitely not the first time that a Detroit resident risked their life and limb in a fight to defend their homes from insects. In January 2016, a Detroit man tried to burn the bedbugs out of his apartment by dousing furniture in alcohol and attacking the critters with a lit cigarette. As one would assume, the mission didn’t end well–the man was badly burned, four apartment units were destroyed, and two dozen other units suffered water damage from the resulting fight to put out the blaze. In the previous year, a woman in Detroit also tried to use fire and alcohol to drive out bedbugs. The attempt backfired when 48 units were destroyed by smoke, fire, and water damage. The woman, a neighbor, and three firefighters were hospitalized as a result. According to statistics, the 50-year-old man is one of thousands of people in the United States who inflict injury or death on themselves through unintended shootings. Almost 6,885 people in the U.S. have died from 2002 to 2016 due to unintentional shootings. In the meantime, however, we’ve yet to hear of similar figures from the cockroach camp.